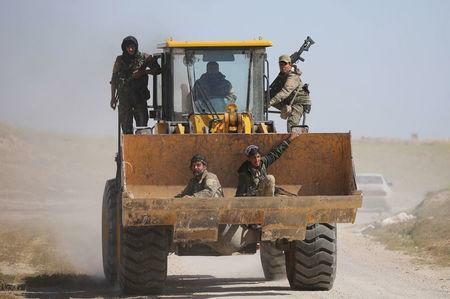 "Our forces are still conducting combing and search operations and as soon as they are finished we will announce the liberation," Mustafa Bali, spokesman for the Syrian Democratic Forces, said in a note to journalists. "These women and children are in the worst condition we have seen since the crisis first began. Many have been caught up in the fighting and dozens have been burnt or badly injured by shrapnel," Wendy Taeuber, IRC’s Iraq and northeast Syria country director, said in a statement. "We are expecting another 3,000 to arrive soon and we are very worried that they may be in even worse shape." A report issued by the United Nations' population fund, the UNFPA, on Thursday said "it is estimated that around 7,000 people are still inside" Baghouz, without elaborating. U.S. Secretary of State Mike Pompeo, on a visit to Jerusalem, told reporters victory was "close". He was proud of "the work that the United States did, the Department of Defense did, that the folks fighting down in the Euphrates river valley did", he said. "The threat from radical Islamic terrorism remains. We need to finish out the last few square meters there, in Syria. Still work to do." The Pentagon's internal watchdog released a report last month saying Islamic State remained an active insurgent group and was regenerating functions and capabilities more quickly in Iraq than in Syria. The group could resurge in Syria within 6-12 months and regain limited territory without sustained pressure.